When the temperature finally dropped, the spinning bug came back with a vengeance. I've only had time here and there to spin a little in the evenings, but after a month or so, I've accrued a few beautiful additions to my stash. Maybe you could use a little visual fiber pick-me-up this morning? I know I could. Enjoy the rest of your week. I've got some heathered merino on the wheel to keep me busy if I can find a free minute aside from schoolwork and knitting time. Keep your sweaters on! I'm not a spinner so 'always assumed the generally garish appearance of dyed roving yielded an equivalently loud yarn. Your links to the roving for your handspun show me a different way to see it and imagine the potential! Beautiful yarn! It makes me wish the spinning bug would bite me too! Mmm, gorgeous. Love the muted Autumnal colours. Oh, for spare time from schoolwork! 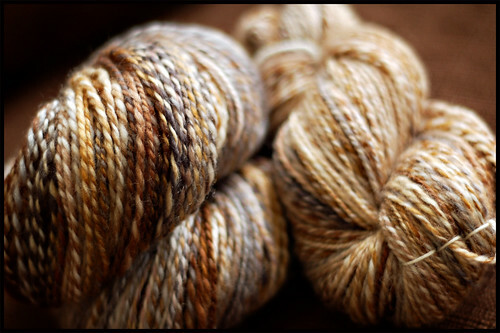 As a non-spinner it's fascinating to see the dyed roving and the yarn that it can produce. Beautiful. Thanks for the pick-me-up! Your lovely yarn is making me crazy - I want to learn to spin! I'm a potter, too, and I love the whole process from making my own clay to the finished glazed piece. I wanted to keep knitting at a place where I could buy my yarn and go from there. I've started to want more of the process, though. My arm is slowly twisting. I'm so glad you link to pictures of the unspun roving. I don't spin, so I can't imagine what roving could turn into under skilled hands. It's quite the transformation. I love your pictures! You should make a "yarn pictures" calendar or something. I'm sure people would buy it! Gorgeous yarn! 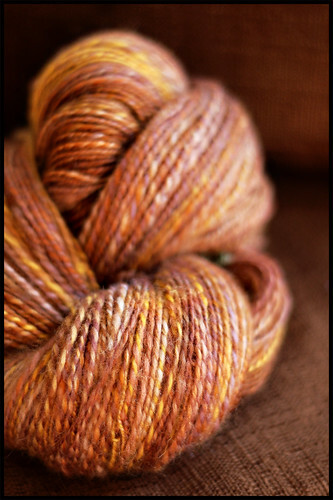 I love how you provide the links to what the roving looked like before you spun it! I am a very new spinner, and you have made me want to run and get my drop spindle and get better! No guilt, hmmmm.......I'll have to try that this year. Love the colors, as usual. Looking forward to seeing the end products. Your spinning is wonderful. I always love a bit of white in a hand painted roving. It adds so much interest in the final yarn. I hope you can share pics of your finished projects. I am fairly certain the fullblown spinning bug will pass me by as it would compromise my knitting time. 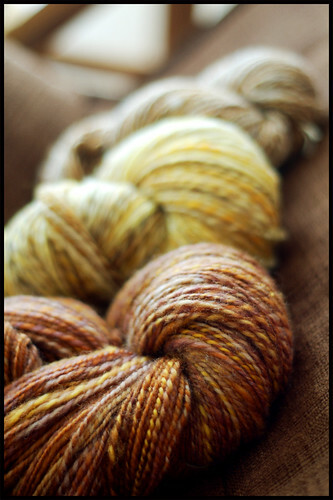 That said, I am seriously contemplating a spindle class to spin some sock yarn for some me socks. Is that like the gateway drug? Oh so beautiful! You're making me run for my spinning wheel now! I like your Holiday knitting policy too. Thank you for a lovely pick-me-up! Your work is wonderful. I hope all is going well with school. That's a much better holiday knitting strategy than mine. Mine's a bit...not working. thanks for sharing. they're all gorgeous. whoever ends up with the finished products will be very fortunate indeed. Your spinning, like your knitting, is disgusting. Disgustingly beautiful. I love those colors. Love your blog and your pics, as usual. Thanks for the guilt-lift about the holidays--I like your policy! Beautiful..I have always wanted to try spinning. My LYS has classes and you can rent a wheel. Seriously considering it. What kind of wheel do you use? Your yarn is gorgeous. And your photos show it off beautifully. Ohmigosh I am floored by what human hands do! 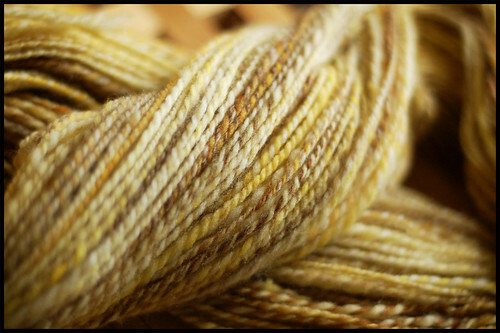 Can't imagine how beautiful your yarn would be to touch and see in person. I try not to knit to Christmas deadlines. I make a few hats and kiddie items, but I like my knitting to be the antidote to the gatherings and concerts and preparation. I'm not sure I'm wired for "guilt free". I mused at your no guilt gift giving. It seems that this is the same way of thinking I have adopted for this season! I have tried the making a list of everything I wish to make for everyone. Which only results in driving myself bonkers as well as sucking the joy right out of knitting. Afterall, Joy is what knitting is all about. 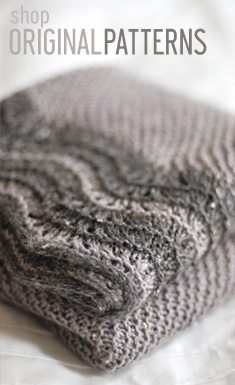 Especially in the chilly months, when one can knit happily with a lapful of wool and not melt. Cheers to you Jared. Lovely yarn. A super fall at its best pick me up. Thanks To day is my Fri and I'm a passenge on trip to Portland, OR tommorow so lots of knitting. Then when there time to explore yarn shops in outlying towns. One shop even sells spinning wheels! On my. . . I might get a little weak when I see them and think of your lates stash addtions. I couldn't agree more with your sentiments on holiday gift knitting. I wish my coworkers would stop trying to comission me to knit things for them that I have no desire to knit. would you please come to my house and photograph my yarn and projects? yours are always so beautiful. how on earth do you do it? every time, too! i want that yarn. got some serious yarn lust going on here. As soon as you're finished with school, please spin and knit all of the time, so you can sell your yarn!! Yes! I love the colors. glorious stuff, that handspun of yours. I'm taking my first spinning class on Saturday....and I'm completely inspired. How do I get on your Christmas list? Beautiful fiber :-) I love the Lazy Daisy!! Thanks I needed that pick me upper!! !haha Beautiful work on the yarn!! thank you for that pick me up! wow - the colours in the yarn and in the photos are so warm and delish!!! I like the espresso best - it is divine! Wow! Your yarn is absolutely gorgeous! Hey! I tried to email you but your box is full. 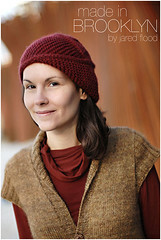 I finished the Cobblestone sweater and posted photos to my new blog. Check it out at http://alicethelma.com/. I had so much fun knitting it. Dear god, dear god, how can I NOT learn to spin now??? *whimper* Those are SO PRETTY! ...crap, and I barely have enough time to knit as it is. your skeins are very beautiful. I am coming out of lurkdom to ask you a spinning question today. As I am spinning 1.5 lbs of romney roving from the NYS sheep and woolfest, and liking it quite a bit, I am wondering if you also measure your skeins in yards, not just by weight. How will you know if you have enough for a project? I have a niddy-noddy for skein winding, but measuring one go around gives me varying results. I've never spun and don't own any of the implements to do so (yet), but these delicious hanks sure do make the temptation to start VERY strong. Nicely done. I tried to email you a bit ago....is your email changed? Absolutely divine. Very inspiring, Jared! The colors are lovely. Your spinning is so beautiful. My spinning is not to that level yet but you have me inspired. Wow. Your spinning is so even and the colors are lovely. Hope you're staying sane while balancing school and wool! I love the colors in that Icelandic wool. wanted to compliment you on this really beautiful handspun, and more on the wonderful photos you take of your work. I find that to be the most challenging part of blogging and it is the most critical for capturing attention. Your photos and models are just great and I really admire your work!